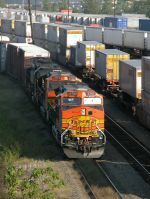 Description: BNSF train M-NWOLAL1-22A pauses at the Schriever Depot on the BNSF Lafayette Subdivision. Description: BNSF train M-NWOLAL1-22A charges past the Dragging Equipment Detector at Chacahoula on the BNSF Lafayette Subdivision. Description: BNSF train M-NWOLAL1-22 eases across the recently damaged Bayou Boeuf Bridge. Description: bnsf 4783 heading west at marina near alma, wi. 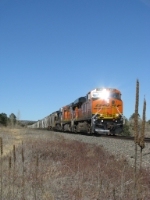 Description: A Southbound BNSF Unit train From Iron City to Pueblo.